The Middle East, due to its geographical location, is particularly prone to the impacts of climate change. Longer droughts, more frequent and intense heatwaves, and higher temperatures in the summer are expected to to become increasingly prevalent throughout the Middle East – from Sana’a to Jeddah to Dubai to Tehran. Yet, the lack of awareness towards the issue, especially on individual levels remains prevalent for the most part. The United Arab Emirates, however, is now working on incorporating climate change adaptation and mitigation in its national agenda and has also made it part of its vision to increase environmental awareness amongst its public. In 2016, the UAE renamed it’s Ministry of Environment and Water to the Ministry of Climate Change and the Environment, thus officially bringing the management of climate change within the scope of the ministry and includes organizing “awareness campaigns in order to promote the environmental behavior of individuals” to its sustainability agenda. A 2017 study by the United Arab Emirates University (UAEU) revealed that more than 40 per cent of the UAE’s population lack knowledge about climate change, global warming, and how human behavior contributes to environmental harm”. Fatima Al Ghamdi, is a UAE-based climate activist, who has recently launched an advocacy group that aims to bring a shift towards a more plant-based diet in the Middle East by working on the grassroots levels. She launched a campaign to encourage plant-based diets in the UAE in early 2017 and is planning to expand her network to the rest of the region next year. Her campaign and advocacy work includes raising awareness in schools and universities about the benefits of reducing meat from daily diets, the impact of the meat industry on the climate, and what individuals can do to eat in more sustainable ways. “I think there is a reluctance by climate change advocates and policy makers to intrude into people’s lives to the levels where they start telling them what to eat and in what quantities,” she says. 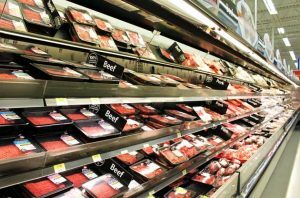 Curbing the world’s huge and increasing appetite for meat is essential to avoid devastating climate change, according to one of the most comprehensive studies on the topic published in October 2018 by the journal, Nature. In addition, according to the Intergovernmental Panel on Climate Change, the global livestock industry contributes close to one fifth of greenhouse gas emissions – even more than the combined emissions of all cars, planes, trains, and ships. “If the top 20 meat and fairy companies in the world were a country, collectively they would be the world’s seventh largest greenhouse gas emitter,” says Daniel F Kenneth, a professor of public health nutrient, based in UAE’s capital, Abu Dhabi. He adds that it is cattle and meat industry that has the most long-reaching impact on the environment – more than one-third of the world’s methane, which is 20 times as damaging as carbon dioxide in terms of global warming, is said to be produced by cattle, including those used for milk. This is why most environmentalists consider industrial cattle farming a triple threat to Earth’s atmosphere, as animals produce huge amounts of the greenhouse gas methane, coupled with the loss of carbon-absorbing forests that are accommodated into grazing areas, and the immense amounts of water needed to sustain the livestock. According to Kenneth, producing 1 kg of beef is estimated to require close to 14,000 litres of water and 7 to 10 kg of feed. In comparison, it takes approximately 1000 litres of water and just 2 kg of feed to produce 1 kg of chicken. The UAE, despite being considered a “food secure” nation, relies predominantly on food imports, with up to 80% of its food imported from other countries. The report published by Nature calls for a “global shift” towards more plant-based diets, slashing food waste, improving farming practices with the aid of technology, better education, industry reform and improved efficiency as ways towards tackling the problem. “In the Middle East, we used to have diets that focused on rice with lentils and chickpeas. That’s the way we’ve eaten for ages, with just small amounts of meat,” says Al Ghamdi. Nature’s report emphasized that, coupled with a sharp projected rise in global population and global incomes (that would enable more people to eat meat-rich diets) by mid-century, the industry’s already vast impact on the environment could increase by as much as 90 percent, unless an active effort is made to reduce it.